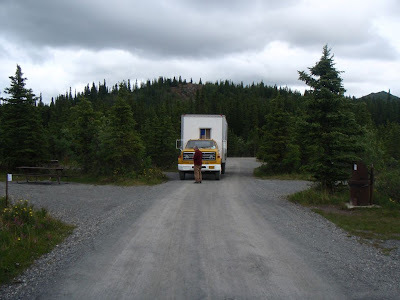 June 28th Bill and I hit the road to Denali, a 3 hour ride south of Fairbanks in our yellow mobile lunch box. The clouds welcomed us. 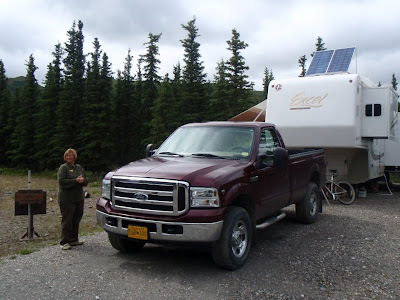 Once at Denali National Park we had to get several vehicle and camp site permits. I walked around in my Alaska State Parks ranger shirt from Kodiak in the visitor center and tourists kept asking me questions about Denali, I told them I'm from a different park. The guy at the front desk asked if we were the folks who found the dino bones a couple years ago. Yep, that was Dr. Suzy on the 2007 UAF Geo Camp, she found some kind of carnivorous dino foot prints that were previously never known to exist in the park. Once the students arrived we did a bear safety class. If it's a Grizzly, stand your ground but don't fight unless it is gnawling at you, if it's Black Bear, be aggressive, throw rocks. How to tell the difference between the two? Grizzlies have a hump above their shoulders. There was an instant rush of the wild going up my spine. Into the Wild... sort of. 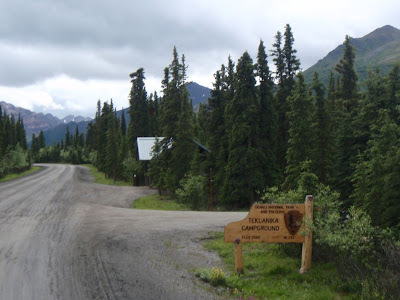 Home sweet home... Teklanika campground. Here was one of our camp hosts. She was a cool person to talk to during the day when the students were in the field... we chatted about Nova Scotia, pasta, bush fires, birds, etc. We were able to get 5 camp sites. So where do we put the truck Bill? Here he says. Alright, cool, now let's get all the junk out of my house so I can get to cooking. They staff gang begins to set up tents while I unload the student totes/bags. Around 8er I begin cooking some fried catfish.. simple, easy, good. Next morning they all gather after breakfast to plan their traverse routes in the mountains where they will be taking GPS measurements in correlation with their geological observations. I start my culinary plan of attack. They leave, I'm done planning, I run a few miles up river to see what's around... nothing but wolves and moose. I get back to camp and the sky is darkening. They still gone. Even more beautiful, I did up a whole line of various pizza breads. After that dude and I played guitar and water jug... he played some blues while I hit the beat. Some of the students got to their work and were excited to analyze their first findings. After dinners I take a walk by the river. Drag gray water bucket to gray water bin. No food, no smell allowed near campsites, otherwise bears will come. I eat lunch and think of what to do next for my down time and dinner prep. Play guitar is always a good choice. I hike around the nearest mountain to my chill spot by the river where the wolves are. I strip and bathe in the river. Feels sooo good even though the water is freezing cold and comming from a glacier just 2 miles east of us. I get back to camp all clean and make a big mess again... a Mexican mess this time. Quesadillas, salad, tacos, pineapple and mango pico de gallo, gallo pito, refried bean dip, nachos, only thing missing is some margaritas. We used Tang instead. After din I walk the path to freedom thinking about my babe, thinking about home. Come across a lone rabbit in the woods. Go back to camp and see Dr. Rainer (Rai Dry) talking about rocks in the van. The van was warm, outside it was about 60 deg F. At night it got down to low 40s and in day upper 70s. I take a quick rinse before bed. and first thing I do is put the coffee and water on the burners to create a sauna. I could tell by the shadows what time it was. This is 6 AM. Right in between the two big stalks. I put breakfast out before they all get up. Breakfast starts at 6:30, they eat, they drink coffee, they hang around camp until 8 and pack. Today I sat down to eat my lunch after they left but it got devoured by a bunch of locals. I rest when I can since I ain't getting any sleep in this 24 hour daylight, 18+ hour day job. Wolfy. I saw a few white ones near the woods, too quick to take a picture. My traverse map. I'm the walky talky emergency response dude, if there is trouble they call me and I use satellite phone to call for help. Ya, big bear bite leg, over. Braised basil n' honey pork and catfish. Dr. Rai Dry checking out todays findings. Gangs always hang around the wagon. I hear stories and rumors, rhymes and lyrics, past times and dreams, they ask me questions about life and I ask them questions about rocks. Another day, just being a lizard by the closest thing I have to call a beach. With carrot raisin salad on the side. It's the bomb mates! After dinner the cool kids go to the river to work on their maps.... not. I do some hiking and watch the red clouds move in. Oh no... fires nearby. I've seen this blood red sky before in Australia. My fav. picture of this whole post. Next day, 4th of July, bush fires are all around... let's grill steak. But, first I need to find some firewood for the grill. In a swamp of course. Don't ask why, it's just where the dead stuff was at. I find an old dead tree, and rip it out of the ground. Carry it a ways to the camp. See the mossies? Little buggers they are. Some night I could count 10 mossies on me at once. You can swat, swipe, bug spray and they still get ya. Mosquito coils work okay as long as you're near them. But, in this swamp, they are eevvverrryyywhheeerreee. Cut with the only saw I could find in the tool box, a small tooth steel saw... good luck with that eh? Finally I get to grilling. After dinner Dr. Rai Dry gives a speech. Why call Dr. Rainer Rai Dry? because he called himself Rai Dry when he was drying dishes on night. And I head to the river to watch the sunset. Red haze = fires 5o miles NW. Next day... oriental chix salad. One of my McMurdo specialities. Next morning, only 24 hours to go until I head back to civilization. Anxious, yet hesitant. This is cool and all, but the mossies stink, fresh smelling clothes would be nice, and I'd like to make a few calls. They hang around and talk about how they are going to put their observations onto maps when they get back to the uni. I talk to Dr. about everything they've found. The kids play in the street to celebrate their last night. I say kids but half of them are my age or older, we're all kids. This morning at 8 we begin taking down our camp. One bubble in the magma below gets filled with calcite and silica (quartz) to make this. On the road again... back to the smokey city of Fairbanks. Bye bye Mt. McKinely. I can barely see you. Last time I saw you I was ontop Ruth Glacier with my Grandpa and cousin Steffie. Adios tourists, enjoy the haze. Ha. Along the way we saw lots of old forest fire scars. Welcome back home Fairbanks, a complete whiteout.